Gov. 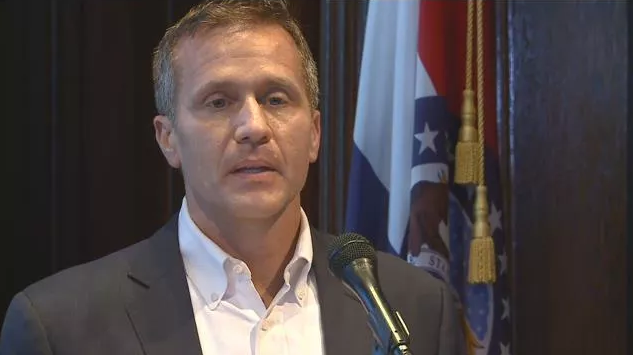 Greitens announced his resignation at a press conference Tuesday afternoon. Greitens, who faced possible impeachment over an extramarital affair and allegations of misuse of a charity donor list for political purpose, said he will resign effective this Friday at 5 p.m. local time. The 44-year-old's brief press conference addressed the investigations and the toll it has taken on him, his family and friends. "I came to office to fight for the people of Missouri ... I am thankful to all those who have worked beside me, who sweated beside me, those who gave their time, their energy and their precious resources, so that we could pursue our mission of taking Missouri in a new and better direction," he said. "The last few months have been incredibly difficult for me, for my family, for my team, for my friends and for many, many people ... This ordeal has been designed to cause an incredible amount of strain on my family ... endless personal attacks designed to cause maximum damage to family and friends." "We must -- as we have always done -- work to improve the lives around us ... I will always be a fighter for the people of Missouri. The time has come to tend to those who have been wounded, and to care for those who need us most," Greitens said emotionally. Even while resigning, he remained defiant. "I am not perfect. But I have not broken any laws or committed any offense worthy of this treatment," Greitens said. "I will let the fairness of this process be judged by history." Greitens didn't take any questions from reporters after his brief statement. He took the oath as Missouri's chief executive nearly 17 months ago with a pledge to root out "corrupt career politicians." He was involved in an affair with his former hairdresser. He had been considered a rising star in the Republican Party and spent nearly six months fighting to stay in officer after that affair became public in January during a TV news report that aired immediately following his State of the State address. The probes into his conduct by prosecutors and lawmakers began with allegations stemming from the affair and expanded to include questions about whether he violated campaign-finance laws. Missouri Attorney General Josh Hawley says Greitens "has done the right thing" by announcing his resignation. Republican leaders in the Missouri House say GOP Gov. Eric Greitens has "put the best interest" of the state's residents first in deciding to resign. Hawley, like Greitens a Republican, said in a brief statement that he wished Parson well as he prepares to make the transition to governor. Hawley says he stands ready to assist in the transition. Hawley is running to unseat Democratic Sen. Claire McCaskill. A former Missouri governor says the state's next chief executive "will be worthy of this new responsibility." Ex-Republican Gov. Matt Blunt issued a statement Tuesday praising Parson. Blunt said Parson will be dedicated to working with the Republican-controlled Legislature to move the state forward. Greitens has had a sometimes rocky relationship with lawmakers. Blunt also noted that Parson is a former county sheriff and called Parson a "law and order leader." Blunt served one term as Missouri's governor, from 2005 to 2009. U.S. Sen. Roy Blunt says Missouri Gov. Eric Greitens' resignation was "the best decision for his family and the state." The Republican senator also said Tuesday that he looks forward to working with Parson and "will do everything I can to be helpful." Blunt previously resisted calling for Greitens' resignation, saying legal and legislative processes should run their course. A St. Louis grand jury indicted Greitens on Feb. 22 on one felony count of invasion of privacy for allegedly taking a photo of a woman without her consent at his home in 2015, before he was elected governor. The charge was dismissed during jury selection, but a special prosecutor was considering whether to refile charges.